No Day of the Dead celebration can be complete without a sugar skull or brightly decorated skull or skeleton. 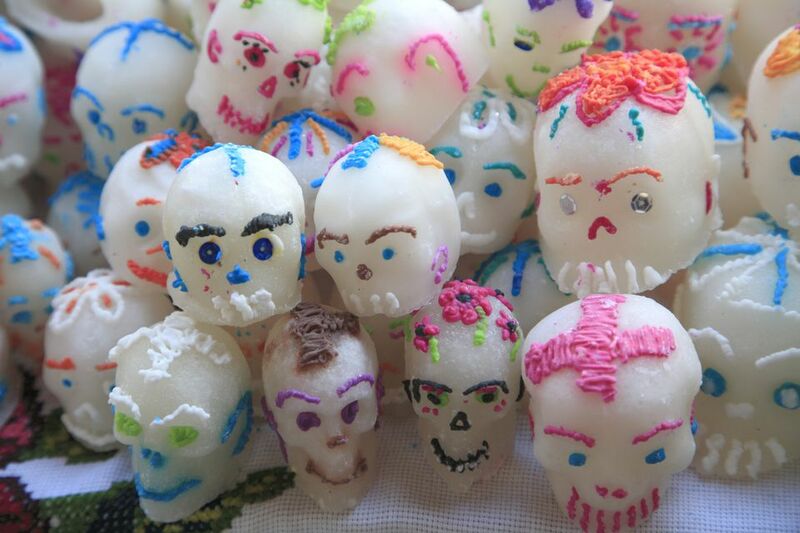 Brightly colored sugar skulls are an integral part of Day of the Dead celebrations. If you want to find out more about sugar skulls or are looking for some design inspiration then take a look at this gallery of sugar skulls. Make a fabric skull garland (this garland has been designed for the Pagan festival of Samhain, however it adapts well to a Day of the Dead celebration. Paper flowers and flower decorations can be used in many ways during Day of the Dead celebrations. Make some as garlands or create some small flowers to decorate altars. Make the flowers from brightly colored tissue paper to add some vibrant color to your decorations. Rubber stamps can be used to stamp the paper before making the flowers to add further interest. Drawn or painted flowers can also make pretty additions to an altar or could be used to make a small garland. If you don't fancy drawing a flower free-hand then check out the flower stencils below. Use glitter glue or glitter pens to add a touch of sparkle to your projects. If you don't have the supplies on hand to make brightly colored paper flowers or paper sugar skulls, try cutting shapes from pieces of colored or patterned paper. Look for Halloween cast-offs that you can transform with paints and embellishments.